Combining the Best of latex, memory foam, Cashmere Blend, hand tufting, and coil technology.The Finest Destination for exceptional sleep is not a five-star resort resting on a white sandy beach, or even an actual cloud… it’s DreamCloud. Delivering a sleep experience of unparalleled comfort and unmatched value, DreamCloud is a super-premium 15” luxury hybrid mattress combining the best of latex, memory foam, Cashmere Blend, hand tufting, and coil technology to provide the best sleep money can buy. DreamCloud uses ultra-premium foams and takes the utmost care during the construction process to ensure that we achieve the optimal balance between support and comfort. When it comes to making a mattress that supports all kinds of sleeping positions (back, side, or stomach) DreamCloud supports all types of sleepers so you don’t have to compromise based on your sleeping position.Stearns & Foster might have good construction, but DreamCloud is a company founded in innovation and technology. According to one third party review site, tuck.com, “The Lux Hybrid Collection includes mattresses with layers of standard memory foam and gel memory foam in the comfort layer. The support core features foam-encased pocketed coils; please note that Stearns & Foster lists the mattresses in this collection as ‘hybrids’, even though they share the same general construction as the three innerspring collections.” We are proud of our efficiency and innovation which includes not using middleman or having stores so that we can pass the savings on to our customers. Due to our quality construction and use of premium materials in all four layers, we can achieve the best of both worlds in hybrid and memory foam mattress. 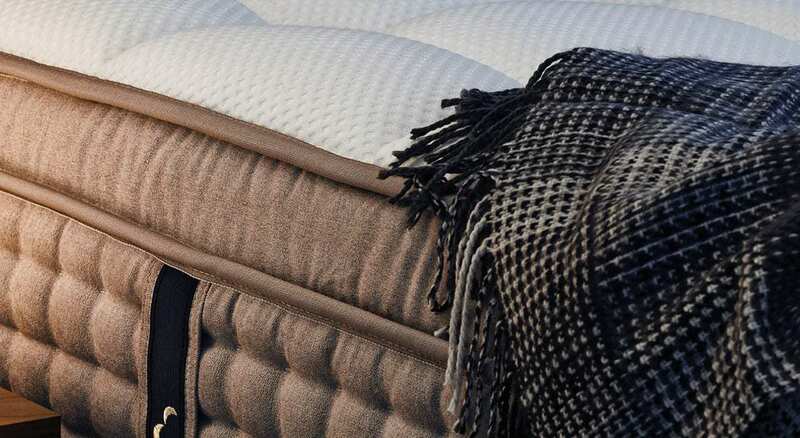 Patent-pending 5 zone DreamCoil coils which have been patented to be the perfect amount of support and spring.While Stearns & Foster offers a luxury mattress, they do not use the same first-class construction and luxury materials as DreamCloud. In fact, tuck.com says, “The price-point of most innersprings and hybrids from Stearns & Foster is above-average compared to similar mattress models.” For example, Stearns & Foster uses a cover with Polyester and Tencel, vs. DreamCloud using a hand-tufted Cashmere Blend cover. Yes, Tencel is cooling, but we built cooling gels right into our mattress system so you can enjoy the plush Cashmere Blend cover and still stay cool – without itchy polyester! In fact many of our customer’s find that the Cashmere Blend cover is so soft, they wish they could sleep directly on the mattress! Customers and third-party reviewers alike agree that DreamCloud floats at the intersection of sumptuous and luscious. According to sleepsherpa.com, “TRUETUFTED™ Cashmere Blend TOP [lets you] Dream your best life! DreamCloud’s Cashmere Blend cover provides unmatched breathability, premium softness and is naturally resistant to bedbugs.” DreamCloud uses the highest quality foams, second to none, to create a place where 8 layers of foam meet coil and gently lapses into a deep deep sleep. Stearns & Foster does not use the same layers of supportive foam, nor our patent-pending 5 zone DreamCoil coils which have been patented to be the perfect amount of support and spring. DreamCloud truly is the only mattress where ever feature ever dreamt has been crafted to transport you to the sleep of your dreams. Night after night after night. DreamCloud uses cutting-edge technology and premium materials to create the best support for your spine.The only affordable super luxury mattress to provide ultimate support and comfort, DreamCloud uses cutting-edge technology and premium materials to create the best support for your spine. Our soft Cashmere Blend, high density foams, reinforced edges, and encased coils allow you to experience the best sleep ever. Our plush euro top serves as a contouring pillow that cradles the body and includes the Cashmere Blend cover, top memory foam layer and the latex layers. Our reinforced sidewalls provide unmatched edge support for perfected sleep quality from edge to edge. Stearns & Foster does not use the same reinforced sidewall support meaning that you won’t get the same level of durability – which is why DreamCloud is guaranteed to last for Everlong instead of Stearns & Foster’s 10 years which is when their full warranty ends. 8 layer system of premium hypoallergenic foams and coils and shipped straight to your door for an affordable price.Previously, 15” luxury mattresses could only be purchased through mattress retailers, at steep mark ups. DreamCloud is the first and only affordable super luxury 15” tall mattress to provide ultimate support and comfort. DreamCloud’s Cashmere Blend cover materials and tufted construction are matched only by top of the line mattresses sold in stores, for thousands of dollars more. Stearns & Foster is $1,399 for a queen – which is $100 more than the price of DreamCloud due to their self-proclaimed “probably the most inefficient factory in the United States,” combined with middleman and retail markups. With DreamCloud, you are never paying these markups. We believe DreamCloud is your first class ticket to the clouds, which is why it is built with our 8 layer system of premium hypoallergenic foams and coils and shipped straight to your door so you can dream the best dream of your life – without breaking the bank. Not only do you get a better mattress for less, you get a 365 night risk-free trial, as well as an Everlong Warranty so you can rest assured your DreamCloud mattress will last the rest of your life. Our soft Cashmere Blend, high density foams, reinforced edges, and encased coils allow you to experience the best sleep ever. Our hand-tufted Cashmere Blend cover is hypoallergenic and naturally bed-bug resistant due to using premium foams and natural latex layer are rigorously tested to ensure their quality and safety for your ultimate comfort. Stearns & Foster only offers a 10 year warranty vs. DreamCloud’s Everlong warranty. DreamCloud offers a 365 day trial period, with free shipping and returns so you can try the mattress on your terms, for up to a full year. Stearns & Foster does not offer a trial period. You can only test Stearns & Foster in a retail store, which is an ineffective way to test your mattress. Studies show that it takes the body up to 6-8 weeks to adjust to a new mattresses, which means you just can’t tell in a 10 minute test of laying down on a mattress in a retail store. DreamCloud knows that, which is why we offer a full risk-free 365 night trial period so you can sleep in all four seasons to make sure DreamCloud is right for you. Without a trial period, Stearns & Foster is asking you to make a large financial commitment to a mattress you just won’t be able to accurately test for your body. DreamCloud offers support and perfect alignment for your spine from the first night, and if for some reason it’s not ideal for you, you can send it back at no cost. DreamCloud is a luxury hybrid mattress that is the perfect firmness, allowing it to be a comfortable mattress for any back, stomach, or side sleeper. DreamCloud is the perfect level of firmness and support. According to sleepsherpa.com, “In terms of firmness, I would say it’s about a 6.5 out of 10 on the firmness scale with 10 being the firmest. If you want a mattress with foam layers that recovers quickly, is breathable and contours well, this would be the ideal mattress for you.” DreamCloud is a luxury hybrid mattress that is the perfect firmness, allowing it to be a comfortable mattress for any back, stomach, or side sleeper. If you suffer from back pain or achy joints, the DreamCloud can help alleviate pain by the combination of premium memory foam that contours to the body, and Patent-pending coils. DreamCloud comes in at 6.5 out of 10, which is the optimal level of support (slightly above medium leaning towards a supportive firm) according to most sleep experts as well as chiropractors. “The soft Cashmere Blend, high density foams and encased coils allow you to experience the best sleep ever. Let’s take a deeper look at the coils: the patent pending “Bestrest” encased hypo-allergenic coils give added support and help you achieve optimal alignment of your spine. DreamCloud is designed for high performance and even distribution of pressure, while molding around your body for any position or amount of pressure and weight,” mattress-guides.net says. You will pay over 5x more for a mattress that does not use the same high level of materials such as hand tufted Cashmere Blend cover and our patented coils. Cashmere Blend is actually a naturally moisture-wicking fabric that keeps you warm in the winter and cool in the summer. DreamCloud does not incur motion transfer due to the combination of plush foams and supportive springs that distribute the weight evenly. “I decided with DreamCloud because of the extra bounce in the springs that having a hybrid mattress provides. After a few nights with DreamCloud I knew I had made the right decision. I can’t imagine anything more soft and smooth, but also supportive. I feel like I’m sleeping on a cloud!” —Manish P.
“Finally after my chiropractor insisted that I get off my springy mattress that was poking at me, I decided to bring DreamCloud into my life. After a few weeks of truly comfortable sleep, I started noticing my back pain subsiding during the day. DreamCloud is a must-have for anyone who thinks their back pain is insurmountable.” —Del R.
“I find myself hitting snooze, and then sipping coffee in bed in the morning, and then skipping my couch at night to read in DreamCloud. The luxurious foams contour to my back so whether I am sleeping or sitting up, I always feel incredibly supported. I can’t imagine my life before DreamCloud, and if I were to guess what actually sleeping on a cloud felt like, it would be DreamCloud.” —Jesse V.
DreamCloud has taken the mattress industry by storm with leading scores from trusted third-party reviewers. When deciding between DreamCloud and Stearns & Foster, you won’t regret choosing the Plush Life.